Almost every other day, an Indian American teen or high school senior or college goer makes way to feature in our continued series of stories about Young Indians in America. Just like National Brain Bee Championship and Scripps Spelling Bee Championship, ‘Jeopardy! College Quiz Championship’ has a track record of Indian American winners. Jeopardy is a most popular live quiz show in the United States. 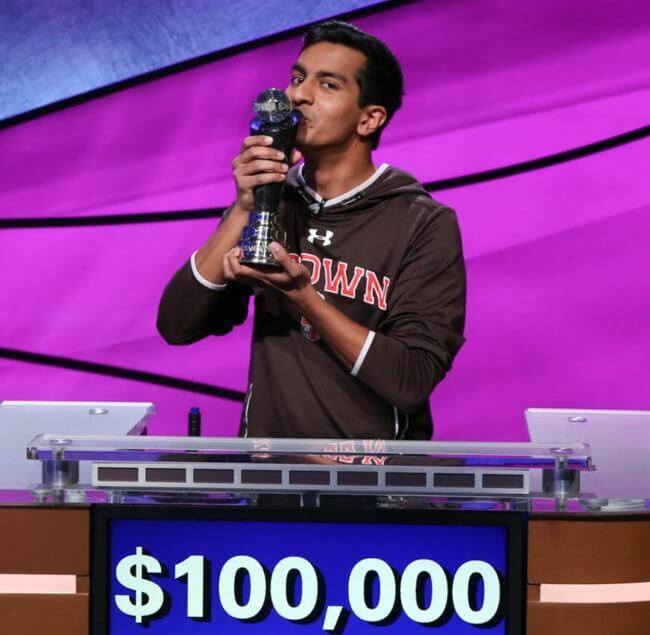 The Jeopardy College Championship 2018 winner, Dhruv Gaur is the first-year student at Brown University in Rhode Island. He achieved an astounding score of 1600 in the SAT college entrance exam and got admission to Brown University last year. He won several state-level championships during high school. He beat out another Indian American, Rishab Jain in the semifinal of Jeopardy Championship and appeared in the final. Since the Georgia native joined Brown University, he had set his eyes on the jackpot of Jeopardy College Championship, and he jumped on to the chance the moment it came his way. After he qualified a 50-question online test, he set out for the next round in Boston where he faced other undergraduate whiz kids. His winning performance in competition with them catapulted him to the show in Culver City, California. “Since early childhood, I have been pursuing my passion for knowledge. Having a wide breadth of information about a whole lot of things on earth, I feel privileged to participate in such games as Jeopardy and showcase the skill that I am blessed with,” said Dhruv Gaur. “However, it was difficult for me to compete with 14 other incredibly talented and brilliant contestants who were potential winners too,” he added. A student of public health and economics at Brown University, the Jeopardy College Championship 2018 winner is not the only Indian American achiever in Georgia, who we are feeling proud of. Two girls from Georgia’s Indian community, Anuhya Tadepalli and Poojita Chinmay founded Chess for a Cause, a nonprofit organization for victims of dementia or other age-related mental health problems in the Atlanta Metropolitan Area. 18-year-old Deep Patel from Georgia is a published author. He penned “A Paperboy’s Fable: 11 Principles of Success,” which is a capsule of age-old secrets to success. Georgia-based Kavin Jayavel Kumaresan was one of the four winners of Travel Beats: Short Story Writing Contest 2016 and awarded with one of the free flights to India from USA by Indian Eagle, a leading travel booking partner of Indians in America. Evidently, there is an increasing pool of talent in the Indian American community. Do subscribe to our free newsletter for the latest community, visa, immigration and travel news, and upcoming contests as well as campaigns.